It's rare that I talk about Press Releases, I prefer to write first hand experience of products, however, I'm going to make an exception to my rule. I've been following Big Green Tree on Twitter for a while and they have a lovely social media presence. It's a friendly and personal approach, like chatting with a friend. Big Green Tree have recently launched an organic skincare line and this compliments the existing Bath & Body range. There are five moisturisers to suit different skin types (Dry, Oily, Combination, Sensitive & Mature) a facial serum, cleanser and toner. The range uses essential oils blended with great ingredients like shea, cocoa and aloe vera. Products are free from parabens and other nasties. I think this is a lovely looking selection of products and I like the natural ingredients used. Prices are not bad either, £9.99 to £22.50. 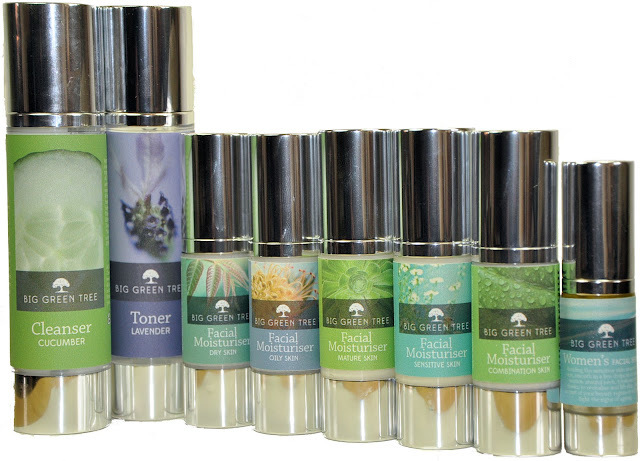 If you fancy treating your skin, check out the website biggreentreetrading.com. P.S - I know they approached several bloggers with a Press Release so hopefully some of you haven't read this ten times already :) Some of these products do contain Phenoxyethanol, I'm aware that some followers prefer to avoid this ingredient. Oh this looks like a nice range, always like to see a new natural skincare range coming out. I'm looking at all options to try and sort my skin out so this can be added to the list.